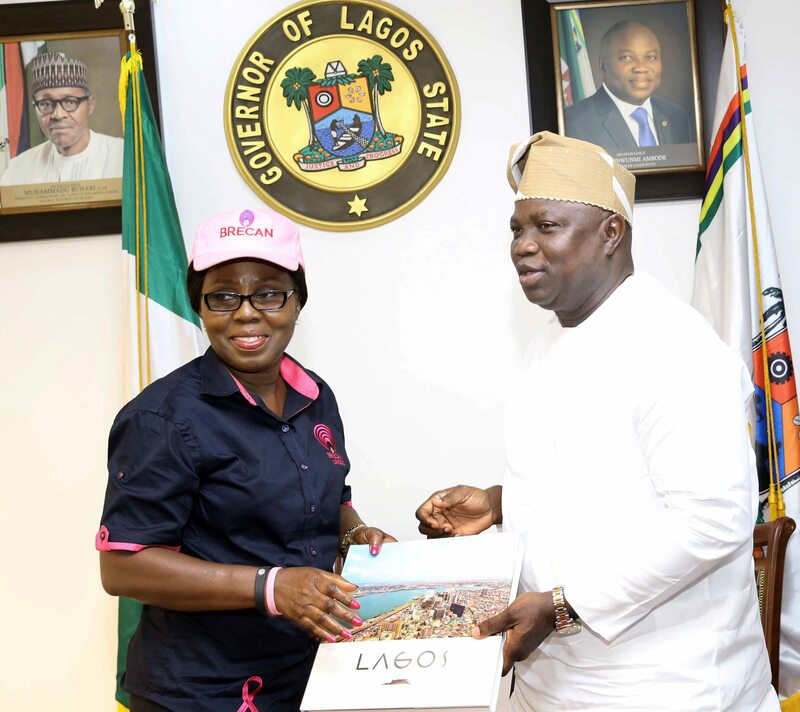 Lagos State Governor, Mr. Akinwunmi Ambode on Thursday counseled victims of breast cancer not to see the disease as death sentence but rather embrace early medical solution to overcome it. 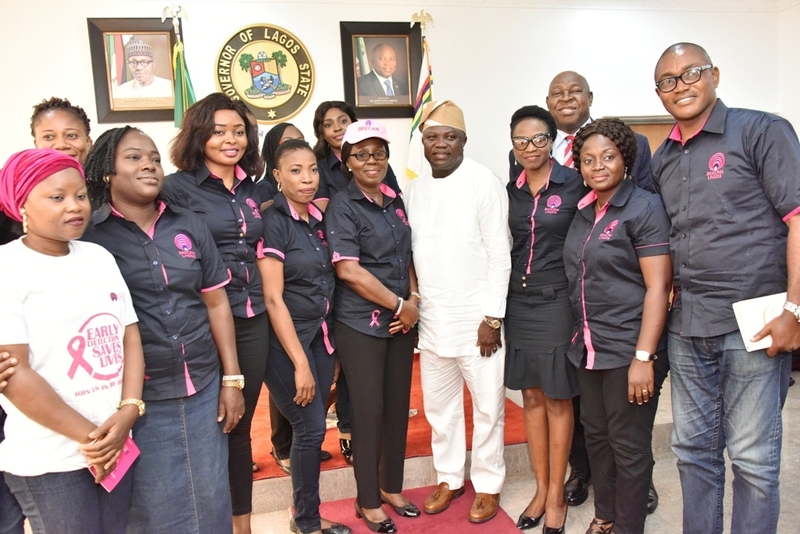 Governor Ambode, who said this while receiving the wife of Ondo State Governor, Mrs Betty Akeredolu at Lagos House, Ikeja on courtesy visit with members of the Breast Cancer Association of Nigeria (BRECAN), said it was time for people to see solution to the disease from medical point of view and not only view it from spiritual or cultural points. 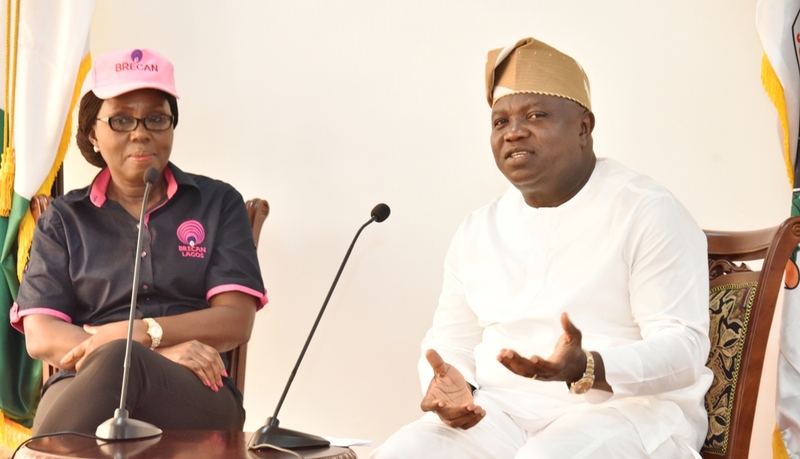 The Governor said though it was true that there is spiritualism, but that the common-sense approach to overcome breast cancer is to seek early medical solution. He said: “This is more about the people at the lower level. People talk so much about spiritual issue on cancer. Yes, there is spiritualism but again there is common sense. This is obviously more about common sense and we don’t want to continue to lose our people. 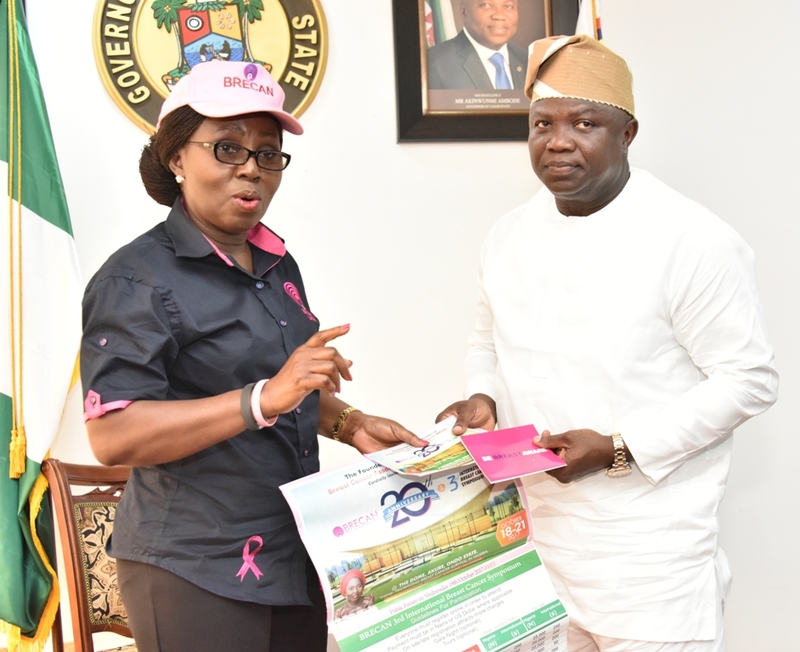 The Governor commended Mrs. Akeredolu for coming up with the initiative to raise awareness about breast cancer, and pledged to do everything necessary to support the overall objective of the group. He said: “The most significant part of this is that you (Akeredolu) happen to be the President of the association, not because you are the First Lady of Ondo State, but because of the fact that you have been a survivor and an advocate of the issue of breast cancer prior to becoming the First Lady and that is very significant for me. “I say this not because you are a survivor but because you are a proud one at that and also trying to send a message that breast cancer is not a death sentence. Twenty years after surviving it, you are seated here and we are propagating something that we should also sell to all Nigerians. “The strong point of this association is more about advocacy to liberate our people from all these cultural myth and things that have actually held us down and eventually allowing Nigerians that have been held down by this to become part of the productive sector of the country which is the main purpose. “When we are able to solve this; when we are able to advocate very well on the issue of cancer, we are technically increasing the GDP of Nigeria because it then means that more people will be part of the production sector,” the Governor said. He said the State Government, through the Ministry of Health and other agencies was already doing a lot on issue of breast cancer, but that more efforts would be geared toward scaling up the advocacy especially at the grassroots. Besides, Governor Ambode also appreciated the Governor of Ondo State, Arakunrin Rotimi Akeredolu for his efforts in securing the release of the six students of Igbonla-Epe Model College. Earlier, Mrs Akeredolu said she was at Lagos House to introduce BRECAN to the Governor as part of activities marking the formal launch of the Lagos State chapter of the association on Friday, as well as seek the support and partnership of the State Government to jointly tackle cancer in the country. The Ondo First Lady, who formed the association twenty years ago after surviving breast cancer, said the main objective of BRECAN was to raise awareness and advocacy about the issue, saying that early detection and medical solution is key to save victim. “People now misconstrue the issue of breast cancer to be a cultural issue or spiritual attack and so they resort to prayer centres. But the truth is that breast cancer is a medical issue. Early detection and care is key. If you notice any unusual change in your breast, go for check-up and not prayer centres,” she said.